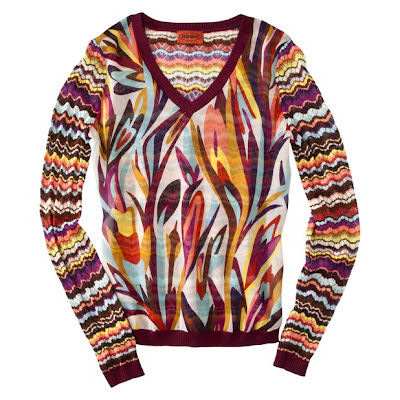 Are you sick of hearing the word "Missoni" yet? Hang with me on this one. How about a gratuitous mirror self-portrait of me wearing one of my new Missoni for Target sweaters today? Okay, okay. It was love at first sight with this shell. Especially the gorgeous metallic gold threads running through it. Does it bring me back to my days of ordering "space-dyed" tops from the Delia's catalog as a sophomore in high school, circa 1998? Why, yes it does. Sweet, sweet memories of my middle sister and I maliciously dukin' it out over who would get to look through the catalog first as soon as it hit our mailbox. We ended up having to order separate catalog subscriptions after it got really ugly more than a few times. True story. At least Sarah and I can laugh about that now. I'm still trying to decide if I love it. There is also a really cute zigzag scarf I got from the kid's section. It's plenty long on me, still just trying to decide if I really need it. Oh, that word: "need." UGH. So much less fun than "want." My office is located near a Target that isn't one of our most popular stores. Because of this, it didn't get picked over quite as quickly as some of the stores closer to town. I stopped by again yesterday and picked up a few more items that I'm listing on eBay. Did I feel like a total scavenger yesterday pulling things off shelves just knowing I was going to relist them? Sure! I absolutely did! But the way I see it, if someone is able to snag an item they really wanted to get that their store sold out of, then everyone wins. Right!? DELIAS!?! Hilarious. Good luck with your ebay items! I am drooling over the v-neck! We are at the beach so I didn't get on :( I have two M. dresses..loves it.. I did not score any Missoni. Very jealous! I HAVE to say that I do love the Missoni color combo's. But it is insanely frustrating that I can't even make it through the doors of Target to look for my daughter a pair of pj's and some lady and her daughter are pushing me over and rushing through the store grabbing up every last Missoni item. I kid you not, every last item. It's people like that that make me swear I will never wear one M item. But personally I don't like being associated with crazes. 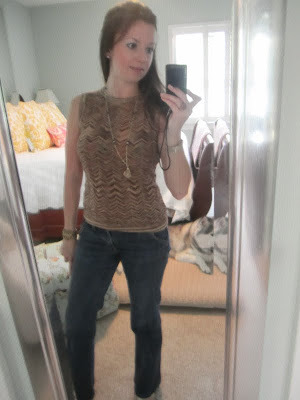 I was admiring the ballet flats in that zigzag print just yesterday!